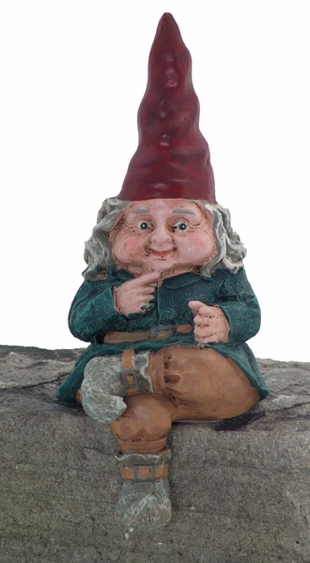 Zelda, our adorable female garden gnome, has a twinkle of mischief in her round, jolly face, but she's really just a kind-hearted sweetheart. Our Zelda shelf gnome is 13 inches tall, the perfect size for sitting atop a garden wall, stone bench, or even indoors on a bookshelf. Dressed in earthy colors and sporting the trademark red cone hat of all good gnomes, Zelda ponders those questions of life with a cheerful smile on her face. She's cute as a button and since she's made from weather-resistant cast stone resin, will stand up to anything Mother Nature dishes out. Hard on the outside, soft on the inside – that's our Zelda.